mysqlmymon.sh is the big brother script to mysqlmymonlite.sh which is much more feature extensive and used for my private paid consults - it produces alot more detailed info for stats analysis and server & MySQL optimization but alot of the info is not suited to sharing in public. So I stripped down mysqlmymon.sh to create mysqlmymonlite.sh with aim of providing as much stats output as possible without revealing any private server sensitive information. 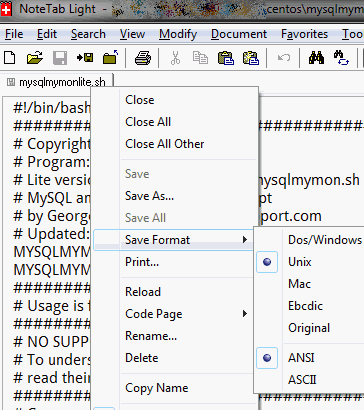 Thus mysqlmymonlite.sh was born and is used mainly for vBulletin server optimisation requests on public forums providing nginx, apache, litespeed web server, openlitespeed web server, mysql, cpu, memory, disk usage stats and general overview of server status in order to understand a vB client's server environment and loads. All this info takes less than <12 seconds to gather once the script is run. mysqlmymonlite.sh 0.4.2 adds MySQL 5.5+ Performance Schema output support. mysqlmymonlite.sh 0.4.8 updated to support OpenLiteSpeed web server. Sample output stats. Currently, 2 methods to get notified for mysqlmymonlite.sh updates. How to use mysqlmymonlite.sh ? 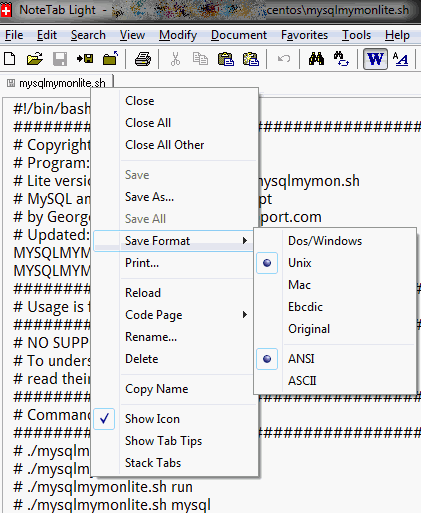 How to install and use mysqlmymonlite.sh video - best viewed in full screen HD mode. echo "iostat -x 5 2"
Full details are explained in readme.txt file included in download zip file. If you're familiar with bash shell scripting and normal SSH telnet environment commands, you can get pretty creative with what you add to incopt.inc file. The download zip file has a readme.txt file which has more detailed explanations and example usage commands - including how to setup a scheduled cron job to save output stats to timestamped text file or email the stats to a specified email address at specified intervals i.e. every 1 hour etc. Sole purpose for mysqlmymonlite.sh is to allow server owners to quickly gather stats for their own use or to provide these stats publicly on forums etc, so that other users and readers can use these stats to provide server recommendations, optimisation advice or troubleshooting advice. If you're using forums as medium for sharing these stats, it's best to use the forum's custom BBCODE tags for code format [CODE][/CODE] to wrap the output stats for easier reading. If your SSH2 Telnet client options allow for it you can increase the size of your scroll back buffer size to allow larger amounts of outputted text to be shown via scrolling back and forth. Or use a text editor which can save the file in unix format. I use NoteTab Lite, open file and right click on the title tab for the filename and select 'save format' -> unix. Then continue editing file and saving it. mysqlmymonlite.sh currently is only available for download from the following locations listed below. As you can see below, besides the main run option which grabs all the stats, there's a few other options you can explore for vmstat and standalone mysqltuner, mysqlreport. The showcreate, showindex, vbshowtables options are for MySQL where you can enter a MySQL database name and output to screen or save to text files the database's tables' show create, show index structure and database's table names. Handy when you don't even want to bother loading phpmyadmin or need to compare a database's table creation and index structure - i.e. output to text file 2 databases' index structure and then use a file DIFF compare tool to compare their indexes on each table. The dblist option just spits out a list of all MySQL databases on your server. All sensitive server hostname info has been masked and rewritten to just show the words 'yourhostname' instead of your real hostname making it anonymous. But please double check your output stats before posting online on forums or in public. For instance if you actually set your mysql password in /etc/my.cnf, the output will show that password, so remove it from output before posting publicly. 648.0 KiB + 135.0 KiB = 783.0 KiB       mysqlmymonlite. 120402 15:57:34 [Warning] '--skip-locking' is deprecated and will be removed in a future release. 120402 15:57:34 [Note] Plugin 'FEDERATED' is disabled. 120402 15:57:34 [Note] /usr/sbin/mysqld: ready for connections.